Chorizo is a type of spicy Spanish or Mexican sausage that is usually made from pork or beef. Unfortunately, chorizo is very high in calories, as well as in potentially harmful dietary components like fat, cholesterol and sodium. For that reason, you should limit your consumption of chorizo, particularly if you are on a diet. One 4-inch link of chorizo contains 273 calories, which is nearly 14 percent of your daily recommended calorie intake. Each link contains 23 g of total fat -- that is over 35 percent of your daily recommended total fat intake -- as well as 8.6 g of saturated fat, which is over 43 percent of your daily recommended saturated fat intake. If you eat too much saturated fat per day, you can significantly increase your risk of contracting heart disease and similar conditions, according to the Harvard School of Public Health. The chorizo also contains 52.8 mg of cholesterol, which is 17.6 percent of your daily cholesterol intake recommendation. 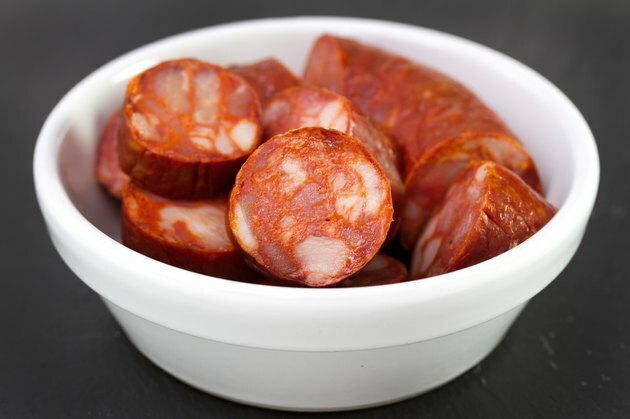 There are 741 mg of sodium in each link of chorizo. That is about 30.9 percent of your recommended daily intake of sodium. According to the University of Maryland Medical Center, sodium is used by your body to help your muscular and nervous systems function; however, many people consume far more sodium than is necessary. Excess sodium intake can lead to elevated blood pressure and an increased possibility of heart attack or stroke. There are only 1.1 g of carbohydrates in each link of chorizo, which is about 0.4 percent of your daily recommended intake of carbohydrates. It contains virtually no dietary fiber or sugars; however, it does contain 14.5 g of protein, which is almost 29 percent of your recommended daily protein intake. Your body needs this protein to recover and rebuild after your exercise. A link of chorizo contains 3.1 mg of vitamin B-3, also known as niacin -- that is about 15.4 percent of your daily requirement. It also contains 238.8 mg of potassium, which is 6.8 percent of your daily requirement; 90 mg of phosphorus, which is 9 percent of your daily requirement; and 4.8 mg of calcium, which is 0.5 percent of your daily requirement. Due to the high fat and calorie content, you may want to choose a healthier option for your diet. Look for low-fat sausage or sausage made with lean meats such as chicken. As well, vegetarian sausage or soy-based chorizo sausage may offer good options to try.